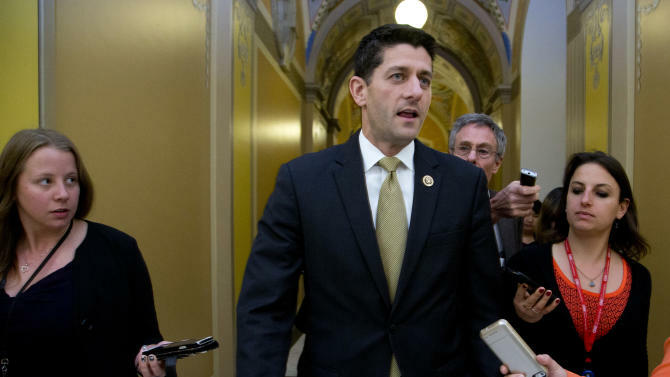 WASHINGTON (AP) — Rep. Paul Ryan, on his way to becoming speaker of the House and second in line to the presidency, says Congress must change its ways. “We are not solving the country’s problems; we are only adding to them,” he says. The 45-year-old House Ways and Means Committee chairman pledges to change that dynamic if selected speaker in elections next week. He is a lock for the job now that he’s secured support from all factions of the House GOP, including the hardline Freedom Caucus. Awaiting him will be a mess of trouble: a Nov. 3 deadline to raise the federal borrowing limit or face an unprecedented default, and a Dec. 11 deadline to act on must-pass spending legislation or court a government shutdown. Despite initial reluctance, Ryan told colleagues he was excited for the opportunity at hand. Ryan initially was an unwilling candidate for speaker, dragged into the contest under pressure from GOP leaders who saw him as their only hope of bringing order to a House GOP careening out of control. Speaker John Boehner announced his surprise resignation last month under pressure from conservatives, and Majority Leader Kevin McCarthy abruptly dropped his bid to replace him. Ryan, the only House Republican with national stature and broad appeal, finally agreed to seek the post, with conditions. He wanted to emerge as House Republicans’ unity candidate, backed by all the major factions of House Republicans, to guarantee he could lead with a mandate — not risk becoming the latest victim of the intraparty unrest roiling Capitol Hill and the presidential campaign. Ryan succeeded in that over the past 48 hours, wringing pledges of support from the three major House GOP caucuses, representing moderates, mainstream conservatives and hardliners. The support from the Freedom Caucus was far from assured, given its rebellious members were responsible for forcing Boehner to the exits and cowing McCarthy, his most likely successor. Ryan’s announcement offers the fratricidal House GOP a chance to chart a new course after years of chaos, and may allow Republicans to refocus away from fighting each other and onto the race for the White House. It was immediately welcomed by fellow Republicans. In addition to seeking united support from the caucus as a condition for his candidacy, Ryan made clear he wanted to cut back on the fundraising that traditionally comes with the job so he could have enough flexibility to spend time with his wife and kids in Wisconsin. Younger than most past speakers and rare in having young kids — Boehner is a grandfather — Ryan will bring generational change to the speaker’s chair. Yet Ryan may be on a short leash with the Freedom Caucus. He had sought to change a House rule allowing an individual lawmaker to force a vote on ousting the speaker at any time, the arcane procedure conservatives were threatening against Boehner before he resigned. The Freedom Caucus did not go along and the matter remains unresolved. And coming votes on the debt limit and budget might be cases where Republican leaders would have to rely largely on Democratic votes to achieve their goals, a practice the Freedom Caucus strongly opposes and wants to see Ryan avoid.